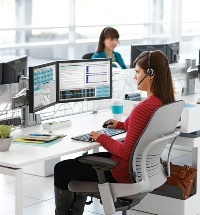 Ergonomic office furniture & the movement toward wellness in the workplace. The costs and benefits that ergonomic office chairs, furniture and workplace design offer can create advantages for both staff and management, because invariably both gain. Managers can reduce costs and improve productivity through ergonomic seating and workplace design, while employees benefit from improved safety, health, comfort, usability of tools and equipment, and ultimately experience a better quality working life. This means staff are more productive—which ultimately increases your bottom line. We recommend that you seek the services of a health professional (Occupational Therapist, Physiotherapist, etc.) if you have a medical condition you are being treated for. We will work with your health professional to find the right solution relating to your ailment. For more information on Wellbeing At Work, please read the article Creating Workplaces for Wellbeing.